Contacts of north Pontic cultures with Criş settlers from the Starčevo–Kőrös–Criş culture about 5800 BC introduced domesticated cattle to the Bug–Dniester culture. Up to the mid–6th millennium BC, the only domesticated animal present in the steppe was the dog. From the mid–6th millennium BC, bone remains of domestic animals are found in the north Pontic steppes, and slightly later in the Volga–Ural steppes (Vybornov et al. 2016). No signs of cultural assimilation have been found with the introduction of Neolithisation to the Bug–Dniester culture, though. The later invasion of Linear Pottery sites ca. 5500–5200 BC respected a similar cultural frontier, geographically coincident with the Dniester. Therefore, the language of western Neolithic settlers—assumed to come from the Middle East, if language accompanied the spread of Neolithic technology—was probably not transferred to north Pontic herders (Anthony 2007). The economy of the Pontic–Caspian steppes did not diverge significantly from a settled hunter-fisher system, though, with elements of animal husbandry found only in the steppe Neolithic cultures, as evidenced by the numerous long-term Mariupol-type cemeteries in the Dnieper region. In the Volga region, a number of forest-steppe settlements provided material with approximately equal number of bones of domesticated and wild fauna, with a considerable proportion represented by horse (Rassamakin 1999). Neolithic period settlements and temporary encampments had an essential hunting economy, as proved by the overwhelming predominance of wild fauna. The shift to imported food-production economy in native foragers seems to have happened first during the Early Neolithic, possibly in the Bug–Dniester settlements through contacts with Criş settlers, ca. 5800–5500 BC. From the Bug–Dniester culture domesticated cattle, sheep, and goats spread quickly from about 5200 BC east- and northward into Pontic–Caspian sites, reaching Khvalynsk and the Samara region about 5100 BC (Anthony 2007). The domesticated horse must have appeared at roughly the same time, having almost disappeared form the archaeological record during the previous Mesolithic period. Examples of horse remains include also sites on the steppe margins, such as the Pit–Comb Ware settlement of Pogorelovka, in the forest zone of the Dnieper left bank; and Neolithic settlements with a developing agricultural economy, such as those of the Bug–Dniester and Linear Pottery cultures (Anthony 2007). The Mariupol culture, appearing ca. 5400–5200 BC, refers to the most distinctive regional aspect of the Neolithic Dnieper–Donets culture, around the Dnieper rapids, with the appearance of deep ossuary pits filled with multiple layers of skeletons, accompanied by copper objects, ceramic vessels, polished axes, and other unusual grave gifts, and correlates with the appearance of domesticated animals in the Dnieper valley (Anthony 2006). In the Late Neolithic Don–Volga–Ural area there was the Orlovka culture in the steppe Volga basin, the Lower Don culture to the south-west, the Samara culture in the east, and the Voronezh-Don culture between the Volga and Don sites. These four cultures were related, and some researchers combine them into the Mariupol cultural-historical area, with similarities between their material culture suggesting a human migration ca. 5200–5150 BC to the north from the steppe Don region into the valleys of the Don, Medveditsa and Volga, reaching the Voronezh basin (Kotova 2008). · The first type of pottery includes high vessels with small flat bottom, pronounced rim-like collars, made of clay containing silt with an admixture of shell, and shaped using plastic moulds. The surfaces were painted with ochre, and motifs are complex with meander patterns and zigzags, made with incisions and comb stamps. · Pottery of the second type differs from the first typologically and technologically: necks are prominently made with the help of rows of deep pits and grooves; bottoms are large and flat; and not all vessels have collars. They are made from silt produced in water basins, and surfaces are covered with motifs made with comb stamps, which point to a connection with local Neolithic cultures. Figure 9. Materials from the Syezzhe burial ground: 1–3 pottery I group; 4–6 pottery II group; 7–8 bone amulets; 9 shell beads; 10 ornament from wild boar fang. From Morgunova (2015). Based on the evolution of pottery, those of the first type seem to have been made by a small group of foreigners that became assimilated by the second group. Due to the similarity with Mariupol pottery, foreigners apparently came from the west, and their influence is seen ca. 5300–4800 BC, corresponding to the dating of the Azov–Dnieper culture and Trypillia A1 (Morgunova 2015). Their burial ritual consists in the extended position on their backs, similar to the Dnieper–Donets culture, with a ritual deposit of red ochre, broken pottery, shell beds, a bone harpoon, and bones of two horses. These are funeral feast deposits similar to the above-grade deposits found later at Khvalynsk (Anthony 2007). The important social and economic significance of the horse – in terms of horse remains and symbolism – in the Pontic–Caspian steppe clearly points to the eastern area of the steppes between the Tisza and the Urals as the most likely zone of earliest domestication, as well as (later) use for transport and horseback riding, although the precise dates of each event are not known. The first quantitative leap is seen in the Middle Volga region (in a close relation to the Volga–Ural region) during the Neolithic. The Samara culture reveals itself as a specialised horse-breeding group based on the increase in the number of horse remains, and in their wide inclusion in cults, rituals, and funerary ceremonies, evidenced by horse pendants, ornamented metacarpi, horse bones, and sacrificial altars. The domesticated horse expanded only later to the western agricultural zones (Dergachev 2007). A third expansion of hunter-gatherer pottery spread from the Volga–Kama region to the east ca. 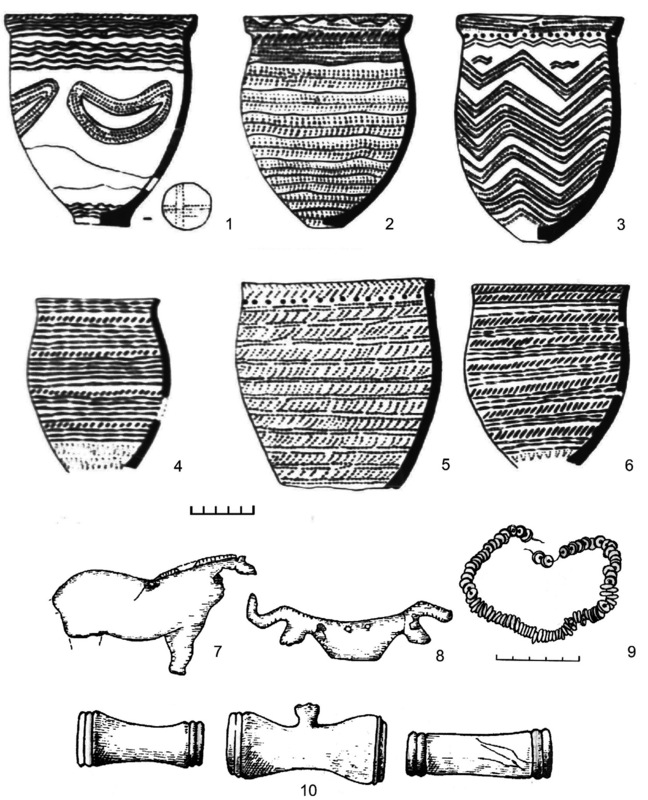 5000 BC, connected to influences from beyond the Urals, showing a more elaborately decorated ware (with bands of pits and impressions made from comb stamps), spreading north and west in the Sperrings and Säräisniemi 1 cultures (Piezonka 2015). The appearance of I2a1b1a2-CTS10057 lineages (formed ca. 8800, TMRCA 8800 BC) in Baltic hunter-gatherers in the 7th–6th millennium BC and slightly later in Ukraine Neolithic cultures—presumably all of hg. I2a1b1a2a2-Y5606 (formed ca. 7900 BC, TMRCA ca. 6800 BC)—points probably to continuous connections of the north Pontic region with the Baltic area, either as remnant populations of the post-Swiderian expansion, or—more likely, since this lineage is also found in hunter-gatherers from the Iron Gates and in later Balkan populations—through the late spread of hunter-gatherer pottery to the north. This is supported by the difference in ancestry between Mesolithic and Neolithic samples, with a clear shift towards WHG (Mathieson et al. 2018). The best fit obtained by including the Sidelkino sample (which had ca. 3% CHG ancestry) in the analyses of north Pontic Late Mesolithic and Neolithic individuals—with some late samples in Deriïvka showing up to 16% Sidelkino-related ancestry—as well as the increase in CHG-related ancestry in these western samples (up to 4% extra CHG) also support westward migration waves through the forest-steppes, likely associated with expanding groups of hunter-gatherer pottery. This conceivable expansion of I2a1b1a2-CTS10057 lineages with hunter-gatherer pottery in mainly east–west and south–north migration waves, coupled with the equally inferable expansion of R1a1a-M198 lineages through the forest zone, suggests that these stepped cultural expansions in eastern Europe were to some extent driven by acculturation of certain groups or alternatively by the resurgence of hunter-gatherer groups among migrating settlers, evidenced by their different Y-chromosome bottlenecks. Haplogroup I-M170 is found in sixteen samples of the Dnieper–Donets culture from Volynsky and Deriïvka sites spanning the whole 6th millennium, and one sample of the Azov–Dnieper culture from Vovnihy (Mathieson et al. 2018). Eleven individuals of R1b1b-V88 lineages found in Deriïvka during the second half of the 6th millennium BC, at the same time as other I-M170 lineages, may represent a resurgence of this haplogroup from the previous Mesolithic population of the area, rather than an actual population movement from the west Pontic area. Two samples of the 5th millennium BC, presumably from early Sredni Stog cultures, show genetic continuity with ancestry similar to the previous samples of the north Pontic area: one from Deriïvka (ca. 4630 BC), and one from Vovnihy (ca. 4430 BC), of hg. I2a1b1a2-CTS10057 (Mathieson et al. 2018). Another sample from Deriïvka (ca. 4870 BC) is a clear outlier with fully Anatolian farmer-like ancestry, clustering closely with Balkan Neolithic and Chalcolithic samples, but shows haplogroup I2a1b1-M223, and thus probably continuity of the male population of the west and north Pontic area. The presence of north Pontic Mesolithic and Neolithic ancestry (ca. 35%) in the Samara hunter-gatherer may support eastward movements into the Don–Volga region, while the increased ANE ancestry (ca. 26%) over the previous Sidelkino ancestry (ca. 37%) probably indicates contacts with the Caspian steppes. Two hunter-gatherers from Karelia also show similar ancestry (ca. 16% ANE, ca. 15–40% Sidelkino, and ca. 13–31% north Pontic), apart from West Siberian-related ancestry (ca. 15–20%), which further connects the Samara region during the Neolithic with the Urals to the east, with the forest zone to the north, and with the forest-steppes to the west. Most likely, the population of the Don–Volga–Ural region eventually represented the Early Proto-Indo-European community by the time of the coexistence of western (Mariupol) and eastern (Samara–Orlovka) communities. The presence of R1b1a1-P297 subclades in a hunter-gatherer from Samara ca. 5600 BC and later in Khvalynsk ca. 4700 BC (see below §iv.2. Indo-Anatolians) supports the continuity of these lineages in the Don–Volga–Ural region and the North Caspian steppes, at least since the expansion of Elshanian pottery, in a population possibly already admixed with other lineages typical of Pontic–Caspian steppe and forest-steppe cultures—like R1b1a-L388, R1b1b-V88, R1a1-M459, or I-M170. This haplogroup variability supports the nature of the region during the Mesolithic as the sink of multiple migration waves, supporting thus the described interaction of cultures. The likely presence of West Siberian hunter-gatherer ancestry (see §v.8. Palaeosiberians) in Khvalynsk seems to support this influence from the east. Ancient contacts between Pontic–Caspian and Kazakh steppe populations are also suggested by the cline formed between Eneolithic samples from the Northern Caucasus Piedmont (see below §iv.2. Indo-Anatolians) and West Siberian HG ancestry. This cline can be inferred from the ancestry of Maikop samples from the North Caucasus steppe (see below §V.2.2. Maikop), which can be roughly described as of North Caucasus steppe (ca. 43%) and West Siberian HG components (ca. 47%), with contributions of an IN-related source east of the Caspian Sea. The expansion of material culture from the west may alternatively suggest an expansion of certain lineages from a Lower Volga region into the Volga–Ural forest-steppes, to form the Orlovka and Samara cultures. A less likely possibility is the integration of lineages from North Caspian (Kairshak and related) groups in the area during the formation of the Samara culture. The presence of materials related to Khvalynsk—probably representing a late expansion—and Mariupol groups—possibly through imports—near the Moksha, Sura and Oka rivers (Artemova, Ikonnikov, and Prikazchikova 2018) attests to the continued strong connection of the Volga–Don forest-steppe and forest regions during the Neolithic. Indo-European has been considered a branch of Indo-Uralic that was transformed under the influence of a Caucasian substratum (Kortlandt 2002; Bomhard 2017), which would imply the absorption of certain Caucasian traits by an Indo-Uralic branch already separated from Uralic. This event can be inferred in genetics from the admixture in the Volga–Ural region, evident in the diversity of haplogroups—including the likely local “resurgence” of R1b1a2-V1636, R1a1b-YP1272, and Q1a2-M25 lineages (see below §iv.2. Indo-Anatolians)—and in the eventual admixture with local steppe populations of elevated ANE/CHG ancestry. On the other hand, haplogroup R1a1a1-M417 (formed ca. 6600 BC) was probably expanding with other R1a1a-M198 lineages, within the north-east European forest zone, likely resurging over an Indo-Uralic-speaking community, and expanding over likely Eurasiatic-speaking groups—which may account for the lack of the strong Caucasian-like features proper of Indo-European—perhaps already close to the north Pontic area. Whether these lineages expanded Early Proto-Uralic through north-eastern Europe, or they acquired the language when infiltrating the north Pontic post-Swiderian cultures, remains unclear.